For management purposes, cats are divided into three categories domestic, stray and feral although individual cats may move between categories. Domestic cats are owned and cared for, and stray cats are those found roaming cities, towns and some rural holdings. Feral cats, which survive without any human contact or assistance, are the main target of control programs. 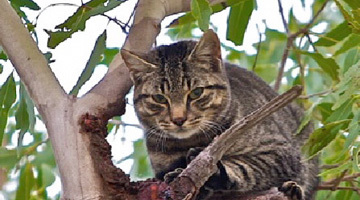 Trapping and shooting are methods employed by Australian Feral Management in the control of feral cats. Cats have been in Australia at least since European settlement, and may have arrived with Dutch shipwrecks in the 17th century. By the 1850s, feral cat colonies had become established in the wild. Intentional releases were made in the late 1800s in the hope that cats would control rabbits, rats and mice. Feral cats are now found in most habitats on the mainland, Tasmania and many offshore islands, although not in the wettest rainforests. While it is impossible to accurately estimate the numbers of feral cats, or the damage they are doing to the native fauna, the National Parks & Wildlife Service estimate that there are over 400,000 feral cats in New South Wales, and as many as 12,000,000 (twelve million) scattered throughout Australia!